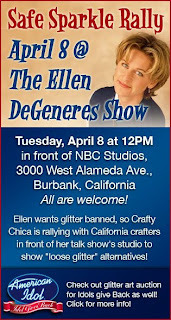 I'm helping spread the word....Via Craft Chica: Apparently Ellen DeGeneres' hates glitter and is (jokingly??) trying to get it banned! Anyone is welcome to join in and protest! WHEN: Tuesday, April 8, 2008. WHERE: NBC Studios, 3000 West Alameda Avenue in Burbank, Calif. I first spied this book on Heidi Kenney’s flickr account since her cute House Pin Board is on the cover (the "how to" project is on page 116). I touched base with Black Dog Publishing who quickly sent over a copy for review. “Making Stuff For Kids” is a great book for parents who may want to dive in a make a project along side their child! There are 50 projects to pick from all with simple steps laid out for projects that include sewing, cutting, pasting, knitting, etc. Each project is tagged with symbols to warn you if adult supervision is needed, messes will be made or if it is a project that will take time and patience. 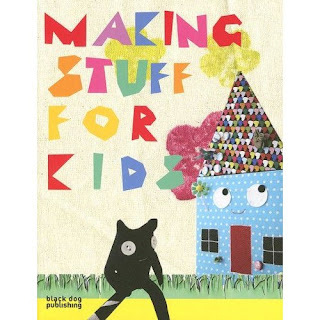 “Making Stuff For Kids” is a great book for your craft library (kids or no kids to be honest)- or a perfect book for a birthday present for your friends little one's!! I love this book. I only wish I had it when I launched my crafty business Flying Fish Design in 2002. First of all, the size of the book itself is perfect for toting around in your purse, the chapters are outlined in a really great way and the books’ corners are rounded to top it all off. Great design!! I love the through advice that Meg gives, starting with creating time and space to start your business. Throughout this book there is advice, tools, resources and ideas; everything you need to establish a structure (or restructure) your business. There are also great discussions/interviews with women who have their own creative businesses, these featured ladies offer up really great feedback from their experience. As I am flipping back through the pages to see what I highlighted when I read the book on my flight to Tucson last month, I am realizing that I tabbed too many pages to talk about. Honestly, there is just so much amazing information crammed in this 160 paperback to try and relay in a quick review. 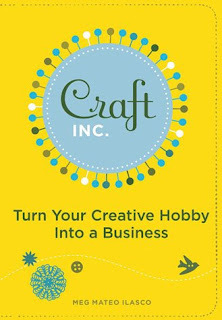 I think that both established and aspiring creative business owners should have this book in their library. Fantastic read and great resources! My advice, pick up this gem if you don't have it already! The March Raffle winner is Stephanie Schneider! Thanks to everyone (95 tickets were sold) who played. Stay tuned for the April raffle going live next week! This time it will be set up so you can buy 1, 3 or 10 tickets at a time. p.s. I used a random number picker to select the winner if anyone was curious. 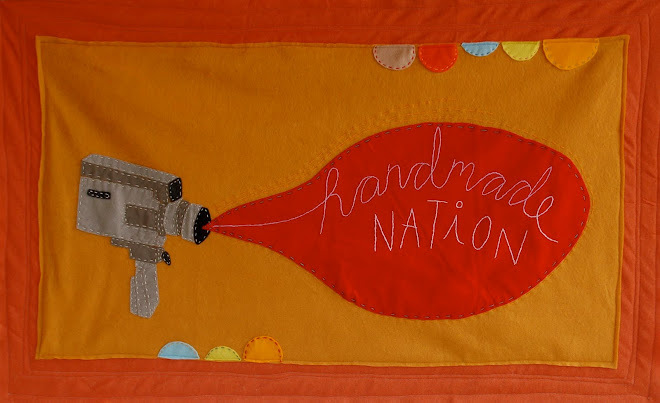 Handmade Nation - a documentary about the indie craft community - is looking for a part time assistant editor (approx 15-20 hours a week) to help in the pre-editing process of raw footage. You will be working under the direction of editor Cris Siqueira. The ideal candidate should have basic knowledge of Final Cut Pro and preferably (but not necessarily) access to a computer with enough memory and space to run the software. This is a good opportunity for editors in training to work in a feature-length project. Please watch our youtube clip before applying to get an essence of the project http://youtube.com/watch?v=zH2HWPfwpOw. Hourly rate $7 per hour to start. I just posted this exact post on Super Naturale and I don't think I really need to change it for here. I was passed a link to this discussion thread via Sabrina Gschwandtner who received it from Andrew Wagner. I highly recommend anyone who has interest, investment or pride about what we call "indie craft" to take a gander and give your two cents. And I second the suggestion of Annie who wrote the initial blog post who states "you might want to brew a cup of coffee before you sit down for this one . . ."
Yesterday I went to FASTEN to help with the CRAFT Magazine release party. Ton's of pictures from around the country in the flickr pool HERE & the Milwaukee pictures are HERE.